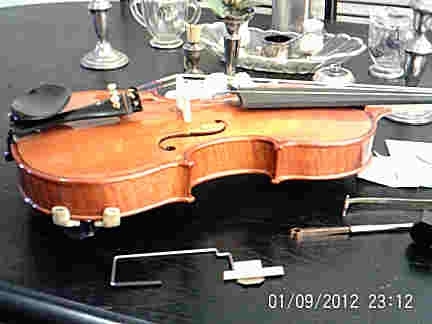 Was playing my violin that I bought back from China and was giving it a vigorous workout with some rather aggressive double stops when there was an almighty "BANG" and every thing stopped suddenly. Scared the willies out of me. Had to check if I needed to change my shorts. What had happened was both the bridge and the sound post 'let go'. Talk about loud. So the next step was to put it back together again. I looked at the bridge and decided that I never really liked its shape anyway so I decided to make up a new one and then reset the sound post. What could be simpler than that????? 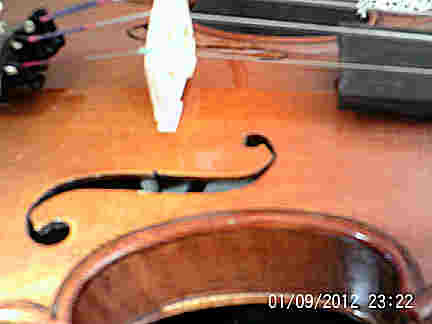 So I undid all the strings and got my 'redressal tool out and started working in the bridge. 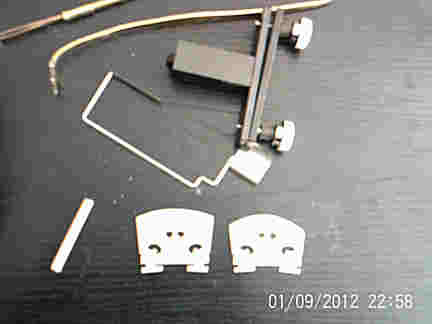 The redressal tool allows you to shape the feet of the bridge to exactly fit 'your' violin. I then put the new bridge in place and with a sound post tool, reset the sound post. Note that the 'black.
' end on the sound post tool lets me know exactly where the sound post is in relation to the bridge (important). 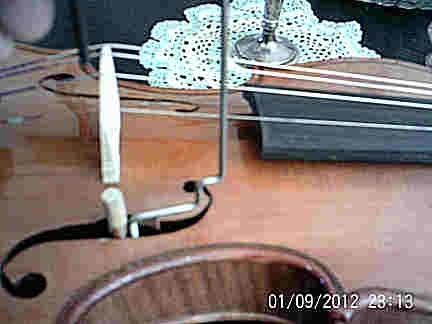 And finaly, the bridge and sound in place and ready to play again. Video of it up and running again. 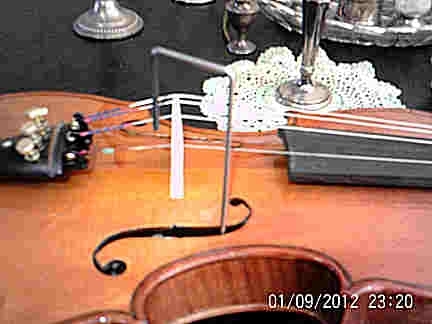 Its Foggy Foggy Dew and the scratchy bits are mine not the fiddle. BTW.... Don't confuse the tunes, 'Foggy Foggy Dew' and 'Foggy Dew'. They're two different tunes...... Really. My hat is off to you... keep those shorts dry bud!!!! Wow, that would have definitely scared the willies out of me! Good job with the repairs! The worst that you could do would be to destroy it, but even that would be educational. Ha-ha Fiddlestix, yea I read that too but figured they just do things real different in Australia! Ferret it sounds really nice now! Congratulations. On your recording it looks like you are using a mute, are you? Do you like the sound better? I'm happy with the sound. Yes, I meant with the mute. 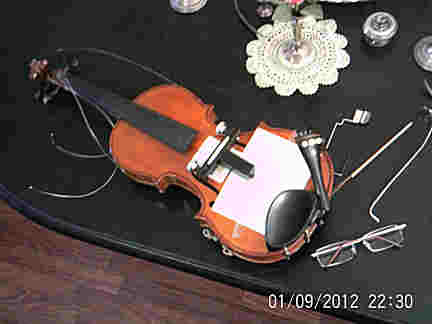 And I did want to know if you liked the sound of the violin after changing the sound-post and bridge as well. I'm quite happy with the overall improvement. 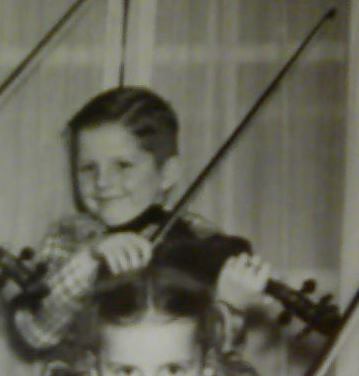 I'm still looking for the right strings for it. Currently it's got Pro Artes on. They''re good but I think I could find better. The concert mute does roughly what I want a set of strings to do. I've also lowered he bridge a bit more. It was a tad high. I reckon that years of 'scratch building' large scale RC aircraft has given me the 'fine' wood skills and confidence to start tackling projects like this. I have had a little 'secret' project sitting on the back burner and after doing this one, I feel that it's time to get into it. Thanks, I checked it out.